Plan on blowing your own balloons? 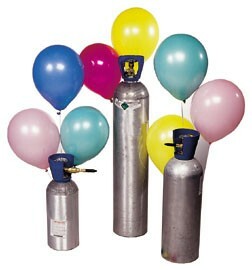 If you would like to pick up or have helium tanks delivered to you directly, please call us in advance. We can however price balloons blown by us as an alternative. * Price includes the cost of loan of the inflator valve. Deposit : $200 will be required as deposit to be left with us during the time our equipment is on loan. Upon return of the equipment on time and in good, original order, the $200 will be refunded. Damages and Cleaning Charges: Customers will be charged for broken, damaged and missing items not in use and protected from the weather. Check with the management of hired halls, convention centers, restaurants and parks to make sure they will take care of our equipment for you before we have it delivered there on your behalf or should you have to leave it there. Delivery charges: Please call for delivery charges. Charges vary according to distance travelled to deliver the equipment. Delivery and pick-up must be made at ground level, to easily accessible buildings and yards. Extra charges apply for upstairs and long distance hauling. Balloon Queen will not be held liable for any misuse or improper handling of our helium rental tanks or any bodily or property damages which result from the rental of the helium tanks. Balloon Queen and it’s supplier is not responsible for any direct or indirect use of the helium tanks. Any third party or user will not hold Balloon Queen liable as well under the same terms and conditions. All helium tanks need to be secured; this is the renter’s responsibility. Helium is a nontoxic, non flammable gas, however it is dangerous to breathe in the gas from the cylinder, or even from an inflated balloon. NEVER Inhale Helium! Inhaling helium gas directly from a high pressure tank can cause loss of consciousness or even permanent brain damage.